Forgive us for milking an old cliché, but cream always rises to the top. Fantastic tone. Incredible string definition. Bespoke service available. Price. Jaime Campbell is a true pickup geek. About a year ago, he put his knowledge of pairing magnets with copper wire to good use to found a new pickup brand called The Creamery. Based in a small workshop in Manchester, Campbell winds a range of vintage and modern voiced humbuckers, singlecoils and P90s. You can buy the pickups 'off the shelf' from The Creamery's website, or have them custom wound to your specifications. We chose a pair of Wide Range Replacement humbuckers based on Campbell's promise of "dynamic, clear and bright tone, but with a solid bottom end". Wide Range humbuckers were originally found in the Fender Deluxe, Custom and Thinline Telecasters of the early '70s. Designed by Seth Lover - the genius who invented the humbucker while working at Gibson in the '50s - the original Wide Range pickup delivers a bright sound that's closer to a singlecoil tone than a 'bucker. "They're like a doubled up Tele pickup rather than a warmer humbucker," explains Campbell. Campbell's replacements are available in two sizes: full size models that will drop straight into an original or reissue Fender Tele, and smaller, standard-humbucker-sized editions with the option of 52mm Fender or 50mm Gibson string spacing. 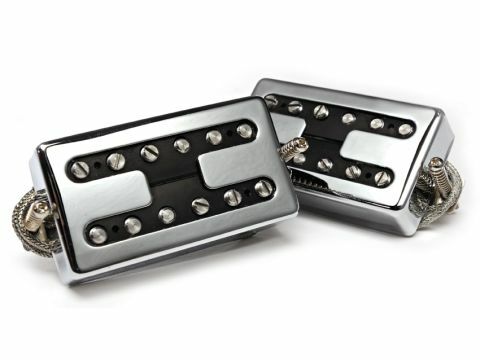 While our pickups came with Campbell's chrome H-Covers, you can spec them with open coils (with black, white or black-and-white zebra bobbins), or full chrome, plated or powder coated covers (in gold, black, cream or white). Tone hounds argue that modern-day Reissue Fender Wide Range pickups deviate from Seth Lover's blueprint and don't quite match the sonics of the original, but The Creamery's version echoes Lover's design with threaded pole magnets. However, rather than just aping the originals - with a matched output for each pickup - Campbell has revoiced the set so that the bridge pickup offers slightly higher output than the neck model. We installed our pickups in a mid-range Les Paul copy, adjusting the threaded pole pieces to match our guitar's fingerboard radius. What we found is that the string definition of these pickups is incredible. Even with copious amounts of overdrive, each note rings out loud and clear within its chord. Played clean in the bridge position, there's a satisfying sparkle that works well for blues and country licks and Johnny Marr-style rhythm work. Then there's the neck pickup - we've never heard a neck 'bucker quite like it. Clean or dirty, it comes over like a super-fat-sounding singlecoil, again with razor-sharp definition, and is great for funky bottom string riffing and noodling way past the 12th fret. Having pickups made to your specification is an exciting prospect, especially when you get bespoke service for the same price as a stock model from some of the pickup world's bigger names. The Creamery has generated an amazing amount of excitement among toneheads over the past year and we're not surprised when it's producing pickups of the calibre of these 'buckers.